“For your information, training for the National U-17 and U-20 boys was originally scheduled on Thursdays and Tuesdays at 4:30pm at the Mannie Ramjohn Stadium, Marabella. 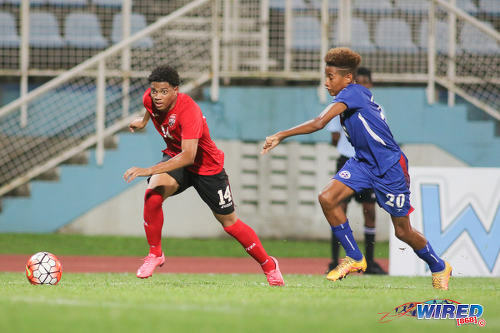 Photo: Trinidad and Tobago National Under-17 midfielder Kishon Hackshaw (left) races away from Bermuda full-back Richard Jones during 2017 World Cup qualifying action at the Ato Boldon Stadium on 18 September 2016. For your information, training for the National U-17 and U-20 boys was originally scheduled on Thursdays and Tuesdays at 4:30pm at the Mannie Ramjohn Stadium, Marabella. This would have caused a little hardship for boys who live in North and in the East, who would have to travel as they would need to leave school early to get there on time. 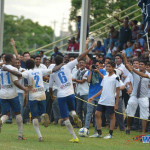 Later on, the training was moved to Larry Gomes Stadium in Arima—on the same day and same time. The hardship was then transferred to the boys from South, some of whom had to travel and would even have to leave school half day early to get there on time. 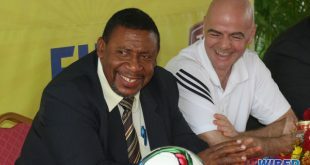 Recently, a decision was made without consultation to swap both teams’ training days so that U-17s would train Tuesday, and U-20s would train on Thursday. Many kids who would have set up their after-school lessons to ensure they didn’t miss training ended up in some turmoil as they felt as if they had to stop going to lessons or be dropped. 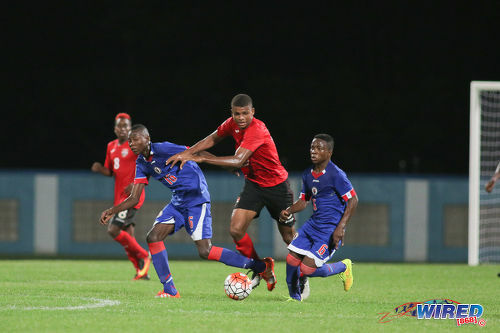 Photo: Trinidad and Tobago substitute Jaydon Prowell (centre) tries to get past Haiti midfielders Obenson Laveille (left, foreground) and Jean Danley during 2017 Under-17 World Cup qualifying action in Couva on 17 September 2016. Keep in mind, many of our talented youth need these lessons to be able to successfully pass their term tests and graduate from school. 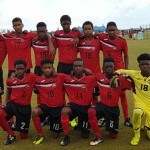 Now, I am being advised that the National Under-20 has had an upcoming trip to Guadeloupe scheduled from May 15-22, which would cause some kids to choose between their team selection and sitting CXC or other exams. Who wins here? These are just a couple examples. There are more, however. Why are we doing this to our kids? Decisions are made and then communicated with very little chance for discussion or review. Who is making these decisions? Have they ever heard of stakeholder consultation? The stadiums being used are well lit. Consequently, most parents, if asked would agree that education is higher priority and allow the kids to start training at a later time—maybe 6pm. Making such heavy-handed scheduling decisions can only shrink our talent pool and cause disillusionment amongst parents and kids. What would be the situation of a kid who goes to Guadeloupe, skips his CXC (or other) exams and gets injured thereafter? How about the kid who needs his subjects to move on to higher level education? 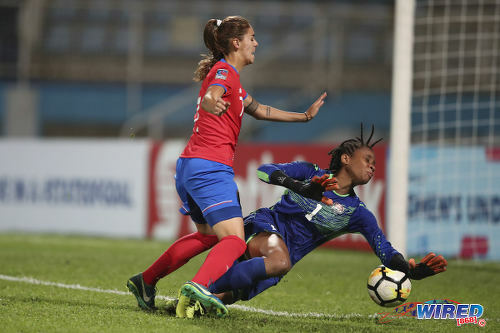 Photo: Trinidad and Tobago goalkeeper K’lil Keshwar (right) brings down Costa Rica attacker Fabiola Villalobos and concedes a penalty kick during 2018 CONCACAF Women’s Under-20 Championship action at the Ato Boldon Stadium in Couva on 22 January 2018. Sir, we haven’t had much success in football as a nation lately, and I submit that the TTFA must improve their consultation and communication efforts to help change that. All of us parents would like to support our kids and the national programme; however, the TTFA is making it extremely hard to do so with its extreme lack of empathy. I hope by writing this letter, it encourages more respectful discussion and consultation with all stakeholders, allowing for better planning, co-ordination and eventually improved on-field success. I know WE can do this. 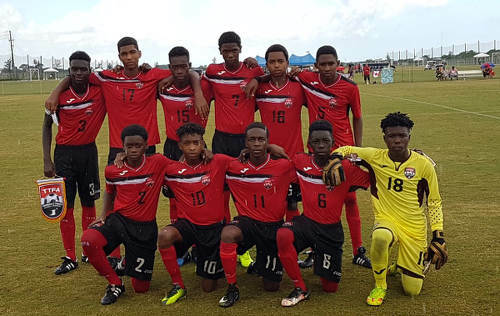 Photo: Trinidad and Tobago National Under-15 Team poses at the 2017 CONCACAF Championship. (Back row, left to right) Darian Bradshaw, Justin Araujo-Wilson, Adriel George, Jean-Heim Mc Fee, Marc Wharfe, Cephas St Rose. (Front row, left to right) Randy Antoine, Josiah Edwards, Jaiye Sheppard, Jabari Lee and Kernel La Fon. All our players at every level in every sport are part timers. Therefore it’s only the odd one every now and again will stand out. What about the youth players from Tobago? The powers that be don’t care. Nello I don’t have nothing more to say on my beloved island. But time longer than twine. What about the parents and students who have always had to travel north for training? There are both sides to this story. I don’t think you read the letter. It is OK for players from south and deep south to travel to POS. My son is from Tobago and he made it. It’s hard. Very hard. I don’t think either of you read the letter. You’re commenting based on an excerpt. As usual the end result is some will decide to drop out the program somebody else take they place we may lose the better players staff and management say go with what we have and licks again. It’s always been a lack of proper Management, communication is just a small part, failure to manage most of if not all sporting bodies in T&T has been our problem for far too long, we usually ride the backs of athletes, check the ones who succeed and in most instances they have had to overcome unnecessary challenges on their own little support from their respective bodies, in this instance Secondary schools football league is the most exciting or attended section of football we have right now and that too is filled with mismanagement and bacchanal every season as seen with Fyzabad Comp. last yr for example and after all is said and done it’s the kids that suffer, we have too many “dead horse” sport bodies in T&T how many of these talented youths play ball after secondary school? For donkey kicking years Tobago footballers and athletes have said the same exact thing. I understand why it’s now an issue though. I was just going to comment on this to say the same thing. This has being happening to Tobago for over 30yrs and no one cared enough to do something about it. Hopefully they’ll hear these parents. For me there is no debate. From the point if view of someone who made the mistake of neglecting academics for football as a youngster i can say that the system doesn t cater for the balance except with lip service. What i will say to parents is if in this day and age with the condition of sport and football in particular , there is NO debate on what choice should be made between an education and representing the country at a youth tourney. Speak to the lady players who left university to come back to represent the country and got spit out like ah ole chung gum . These examples and many more should inform our decisions as parents. Trust me in the long run its not worth it. Nobody cares how much caps or goals you have when you suffering in your 30s or 40s. Travis, I am in sympathy with your essential point but I don’t wholly agree. You say that “Nobody cares how much caps or goals you have when you suffering in your 30s or 40s.” That’s true. But if your implication is that it is more important what CXC or CARE passes you have, that is not true either.When last did someone inquire about your academic qualifications? education. Or Dwight Yorke’s or Brian Lara’s or Shaka Hislop’s or Ato Boldon’s. Do you care? Do they? Does anyone? Now ask yourself about their certification and you will see what I mean. Education is really the utilisation of the acquisition of knowledge, not the acquisition of knowledge in itself. And in my experience–and, I hope, in yours–the playing field is no less important as a place of education than is the classroom; in fact, I am prepared to argue that it is more so. But you can’t convince most of the population of that. And I can’t think of a single minister of education who has demonstrated that (s)he believes it. You miss my point entirely but in so doing you arguably make my point. I’m betting you have a degree? I understand your point about the difference between the educate and certify. My point is the certifying is still necessary. No Subjects, no degrees, etc equal no job. Now just because someone has passes and/or degrees don’t mean they are smart or will be successful. However the system uses certifications to eliminate ppl from certain opportunities. Travis, I talk to players all day about this very issue…most seem to think that professional football in Europe is something easily achievable, I’m not sure who they themselves are speaking too – they seem almost naive about the whole thing. On one hand, who are we to destroy that dream that they may have, on the other – I feel like it’s our responsibility to convey a realistic perspective. It is sad though if through better organisation the kids could have both. Which is precisely the point! But that requires the society–or at least, the powers-that-be–to once more acknowledge the organic link between the two; remember the days when the ministry in St Clair was the Ministry of Education and Sport? As long as we continue to see schooling and sport as two separate and independent activities, crapaud smoke we educational pipe. Tell them Travis Mulraine ! You know everything we did at the College was meant to try to hold that balance! I couldn’t have been more distressed than by the surfacing of certain behaviors in schools in south who seemed to want to cheat the educational system to get good players for their teams. (Not that a certain school in north for years stretched the rules but nothing as blatant as forged certificates) Btw I wonder what decisions will come out of that? I hope parents put their children’s education ahead of that May tournament or any other tournament. Being a National player is not the end all and you do not need it on your resume to get a scholarship. There was a time they provided transport and a snack for the kids, now parents have to find money to pay passage and for their kids to have something to eat after school before training. Some of those kids parents have no or little money but they are happy their kid not on the block so they find the funds. TTFA, you got to do better. When you take time to research the models of many of the top footballing bodies around the world it would be discovered that they have education systems implemented into their academies to create that balance. Why haven’t we given that same care to our young athletes? We’re pushing partial talents and expecting complete results…MADNESS! So true. We not serious in this country. The letter writer is right. If all interested parties are given the opportunity to participate in planning, and evaluation, the disturbance to education, and many of obstacles to participation could be minimised. Good write up …. It’s simply stating facts but I’ve personally been a part of our National youth set up some time back and the issues then is no different to what I’m hearing now……i remember having to leave school at lunch time to catch the PTSC bus from South for practice either at Hasely Crawford or Larry Gomes .Representing your country is something you take Pride in …. It’s like being part of our Armed forces , when called upon you HAVE to report for duty…. In my opinion, regardless to the youths being school kids ,one or two days of practice for the week is still not enough for our players to be at the level we desire of them…..what we sow is what we will reap ….. Suggestion ….. I believe there should be a football school for our National youth footballers whereby they will be surrounded by top coaches and tutors…. All of this should be centralised so that our youths can reap the benefits of being top student athletes . A football college is needed . I’m not sure if this is part of DJW plan with the Academy . Good reply. South youths face the same hardships to attend training in East-West corridor. Do you know the youths have to get their own means of transportation and football equipment like boots especially for training without refund? Why can’t the TTFA invest to 2 buses at least to pick up and drop off the their team players whether south or east/ west etc. Some of the income from the World Cup which can be several millions US dollars can be used to purchase the buses as well as hire drivers. 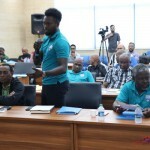 Our football hierarchy especially TTFA Executive needs to remember they were elected to serve and not enriched themselves and their respective clubs. But to ensure development of football in an equitable and fair manner to all our national team players and leagues players. The players are the entertainers and must the focus not members of the executive and their family and friends.